Greetings from Semporna, where I’m counting down the days (5) until I fly to Thailand for my visa run. My first stop will be Bangkok to be a tourist with PC and Tat. We’ll occupy ourselves visiting temples, watching kickboxing, drinking beer and whiskey, and singing karaoke. But I’ll be happy just to see their faces and get a big hug or two from PC…who, by the way, gives the best hugs ever. Try it sometime. Next I’ll fly down to Koh Lanta to meet up with Mikey. We’ll sit in hammocks, play backgammon, eat pork and cheese until we’re sick, drink red wine, go on the odd dive, read books, and probably drink too much on more than a few occasions. But until then, it’s diving diving diving. At least once a week someone asks me how long I’ve been here (4 months!) and if I get sick of diving the same sites all the time. Don’t I get bored? The answer is no, for two reasons. First, though on occasion there are not-great dives, my “annoying optimism,” as one customer jokingly put it, tells me there’s always the *chance* that something phenomenal will turn up. The fun is in the looking. I’m not a museum guide, after all, trundling bored schoolkids through rooms of the same paintings and sculptures every day. Fish move, they try to hide, they act unpredictably, and there are so *many* of them…whose names and habits I’m still learning. Second, there are the customers. They are even more unpredictable than the fish. At times they are entertaining, assholes, awed, impatient, indifferent, fascinated. They ask the oddest questions, tell great stories, confess being nervous, thank you profusely, shrug you off. You never know what you’re going to get. It’s exhausting, trying to keep people you’ve just met happy. That’s why long-term customers (a week or more) are a comfort, even if they’re mediocre divers. At least you know what to expect from them. For the past two weeks or so we’ve had a customer called Alex – an opinionated, hilarious, stubborn-yet-agreeable German dive instructor. He could go on for hours about what makes a good DM, where to find the best diving in Egypt, what equipment is overrated, and on and on. 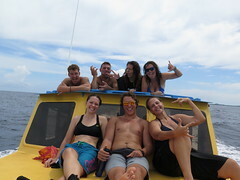 Between dives we’d sit on the front of the boat, sunning ourselves to warm up and dry off and listening to his harangues and monologues. A blast to have on the boat every day. I’m sad he’s gone. Also in the past month we had a couple from…Holland I think? 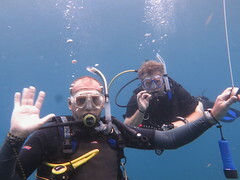 They came a few weeks ago – he’s an experienced diver and she needed a refresh course (which I conducted). 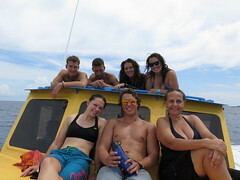 They stayed about a week, went traveling in Borneo, and then changed their plans to come back to dive some more. But in all the time I spent with them, I never heard them say anything truly positive about the diving. “How were your dives today?” I’d ask, seeing them on the jetty and wanting to be solicitous. He would always be the one to answer. “Well, it was OK. Not great,” he’d frown. “The coral is not so nice, and the visibility is awful.” In all they spent about *two weeks* diving here. I used to take the negative comments personally. I was paranoid that my inexperience showed, that I would be called out as a fraud. But the thing is, I’m good at this. Not the best, for sure. But pretty damned good, and getting better every day.